Turning your research into a published paper always involves long hours of sorting through data and ideas, and many, many drafts circulated between you and your colleagues. 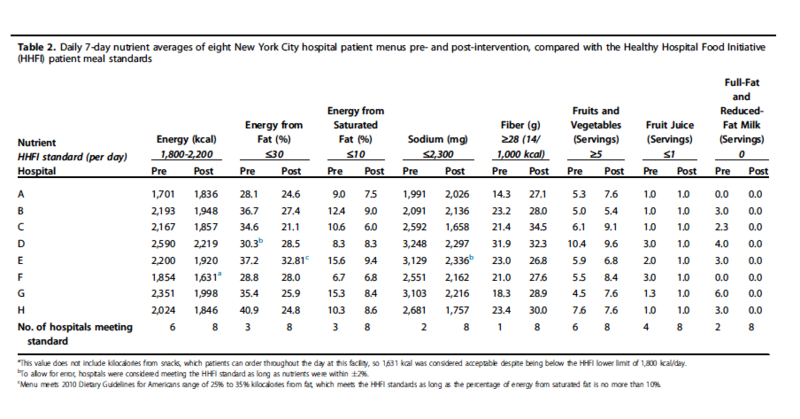 It's a long process that makes it extra rewarding to finally see this latest paper, Use of Nutrition Standards to Improve Nutritional Quality of Hospital Patient Meals: Findings from New York City's Healthy Hospital Food Initiative, in print. My work with the NYC Health Department on the Healthy Hospital Food Initiative has been one of my favorite projects to work on, in part because of the strong partnership we had with the hard-working staff at each hospital, and the large-scale changes many made to their hospital's food environment. With each hospital, we worked comprehensively to get the junk food out and healthier foods in. This is why we not only looked at what they were serving in their cafeterias, but also in the vending machines scattered throughout the hospital floors and even patient meals. This recent paper published chronicles changes made to patient meals, including a significant increase in fresh fruit servings, often taking the place of a refined carbohydrate dessert, or sugary canned fruit. Meals also significantly decreased in sodium and saturated fat, while increasing in fiber. More results can be seen in Table 2 (below) as well as Table 3 in the paper. Find the abstract for the paper here. Find out more about the Healthy Hospital Food Initiative here.